It’d be easy for the Cleveland Indians to rest on their laurels this offseason, what with the excitement generated from their signing of slugger Edwin Encarnacion. However, there’s still work to be done for the Tribe. Not so much within the free agency market, but more so on avoiding arbitration with a handful of players on the current roster. As you know, arbitration is a nasty process teams in every professional sports league look to avoid at all costs. Something about a mediator listening in while a player explains his need for a raise and his team explains why that’s not the case just doesn’t seem all that appealing. So, Cleveland will be looking to settle up with any players who are arbitration-eligible as seamlessly as possible to avoid things coming to a head. This mission was accomplished with one player specifically yesterday, as the Indians and starting pitcher Trevor Bauer agreed on a one-year, $3.55 million deal. Considering he was coming off his best season as a pro, it made sense for Cleveland to get Bauer’s deal taken care of before he had a chance to use this as leverage in arbitration. With that said, there’s more to be seen in this extension than just the concept of avoiding arbitration. Not only did Cleveland avoid a nasty contract negotiation, the team also seems to be telling Bauer he needs to prove himself this season. The Indians had the option to try and lock up their mercurial starter for more than just one additional season, but settled on one year. To be honest, Bauer receiving more than that would’ve been quite a surprise. In his three years in Cleveland, consistency has never really been something Bauer has excelled at. He’ll take the mound and blow opponents away one game, then follow it up with a performance which is all over the place and finished by the end of the third inning. Despite stringing together a few consecutive solid starts this past summer during the Indians’ 14-game winning streak, Bauer still displayed issues with sustaining that success. These struggles continued in the postseason. 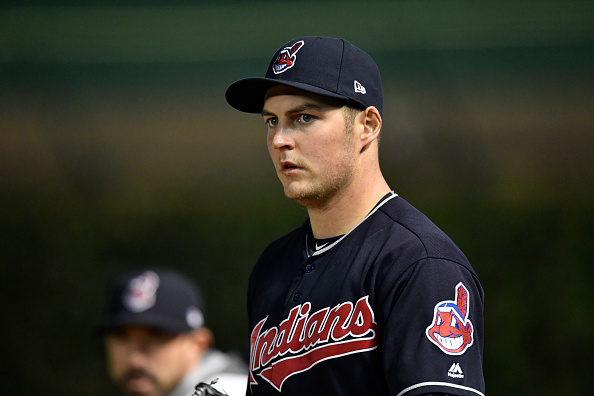 With the team relying on him to pick up the slack from an injury-ravaged rotation, Bauer was only able to contribute performances which were average at best. Of course, there was also the incident where the one of his drones malfunctioned and ravaged the pinkie on his throwing hand. As a result, his inconsistency only increased through his remaining postseason starts. Clearly, the Indians still don’t know for sure if Bauer can be a staple in their rotation. Though it’s doubtful he’d ever be more than a fourth or fifth starter, he’s someone the team would consider locking up if he ever managed to increase the amount of quality starts he could contribute. Which explains why pre-arbitration negotiations ended with a one-year deal. The Indians know how good Bauer can be, they just haven’t seen enough proof that he can perform that well on a regular basis. As a result, Cleveland is giving him another chance to develop some consistency. To finally show everyone who the real Trevor Bauer is. Is it the player who can mow batters down with a surprisingly high amount of pitches to work with? Or is it the one who became a bit of a liability in the postseason and, depending on who you ask, didn’t seem to win over many teammates with his drone accident? Obviously, both he and the Indians hope it’s the former. Otherwise, things get interesting when it comes to Bauer’s future with the team. A one-year deal is hardly what you’d call secure. In fact, come the trade deadline such a thing is an enticing chip to dangle in potential deals. Should Bauer continue to struggle with control, the team may be forced to consider moving him. Though Cleveland has worked hard to keep its rotation intact, it has notable depth at starting pitcher. With players like Mike Clevinger, Ryan Merritt or Cody Anderson available, it may be easier for the Indians to part with Bauer should his issues remain. So, while the two sides agreed on a new deal, it’s hardly one which takes pressure off Bauer. He received a raise, one he was undeniably due. However, he’s still being asked by the Tribe to prove he deserves more. The only way he can do so is to finally cut back on the bi-polar starts. If another year of inconsistency is all Bauer can offer, Cleveland may not have to worry about negotiations with him come this time next year.